Ian: We've learned that the next book in the Chicken Soup series is about to come out on bookstands and this one is called, Chicken Soup for the Volunteer's Soul. Now one person who has read it already says, "It's the kind of book that will make you put down the TV remote control and then go out and make a difference in someones life." 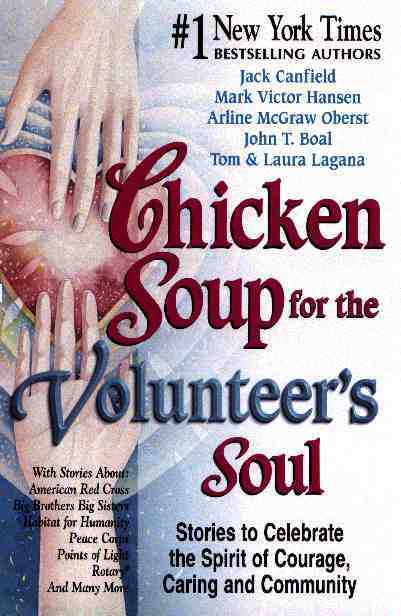 Well, the stories in Chicken Soup for the Volunteer's Soul actually reflect that interest in volunteering but also provide life lessons for many people. One of the stories contributed comes from a Cape Bretoner and it celebrates the work of another volunteer from Cape Breton. Let's meet Elaine Hogg from Port Hawkesbury. She's with me in the studio. "Good morning Elaine." Now what was it about this particular book that moved you to want to contribute a story about volunteers? I didn't know about the book at first and I was just looking for a place to put my stories. I wrote Remembering Honey a few years ago and when I was a volunteer with Palliative Care, I started writing some of my experiences. I was looking for a (publishing) spot and I happened to find their web site. I thought, I'll submit something. So I submitted the first one and they wrote me back and asked me if I had any others. So I submitted the next one and he wrote me back and asked, "Well do you have any others?" I'm thinking, "Oh! Does he really mean this?" I worked with Tom Lagana, one of the co-authors, and he asked me if I would be interested in being a reviewer for the Chicken Soup book because my stories were similar to what they were looking for. For the next two years I was able to read several of the stories of the 6000 that were reviewed for the book. I probably read over five hundred of them to help wheedle it down. Well after reading that many of the stories, then what to you is the essential message that comes through in these stories as published? I think that touching somebody else's life, giving something of meaning to somebody else and funny, it comes back to you. So many people mentioned in their stories how they reached out to help somebody in need and they found something deeper within themselves. I think the selflessness that so many people expressed, enabling them to help another person, that's what touched my life when I was reading through the stories. Now one of the stories is about Rilla McLean. Who is she? She's a fantastic lady who was my neighbour and a friend for the last twenty-five years. And although Rilla has had some things in her life that left her in a wheel chair, her spirit soars and she is a real go-getter in our community and has inspired other people. Its not unusual to see her pick up garbage from her wheel chair on a May cleaning day or be behind the Terry Fox Run or help a neighbour who has a child who may be having some reading difficulties and shell buy a book and help the child read it. She has no children of her own but many of us have used her as an aunt. She's just a wonderful person to know. Besides your recognition of her efforts in this story, how good have people been to recognize her volunteer efforts? A little bit slow. That's why the story got out. She won a major award from Canadian Airlines in the year 2000 for her spirit of Volunteerism and we were chatting one day and the radio hadn't picked it up, the media hadn't picked it up and so I said, "Do you mind if I write about it?" This was twenty minutes before I was taking off on a major trip to New Zealand. So I got as many notes as I could in twenty minutes and on the plane, on my way there, I wrote the story and submitted it because the official deadline was already passed for stories and submitted it to Volunteers. While I was over there, Tom notified me that my story had rated 10 with eleven pluses beside it. We were very hopeful but we didn't know until March that the story actually made it in. That was a year and a half later. How many stories make it in? I was told 87 out of 6000. Only six or so Canadians. What was it in the story of Rilla McLean that helped it make that select group? I think the fact that Rilla's story speaks to the ordinary person. The person who doesn't have to be the fund- raiser, with a lot of abilities, or very attractive or all these things. It's the ordinary person who is willing to do what they see around them and they make a difference in our communities and in our lives. What then is your hope for the impact of this story now that it is coming out in this book? I think that my hope for it would be that it would be an example for other people. You don't have to be somebody with a big education, although Rilla has that. You don't have to be able to run the mile, although Rilla has done the equivalent of that but you have to look around and make a small difference in somebody's life. Really, this can be a turning point. Somebody who cares for somebody else can be the turning point of whether they experience despair or whether they experience life. I thank you very much for discussing your work as well as that of your friend, Rilla McLean, with our listeners across the island this morning. Thanks very much for making the trip into our studios. You're welcome. Its been a pleasure. Elaine Hogg is a writer from the Port Hawkesbury area. Her story about Rilla McLean is included in a new book in the Chicken Soup Series, called Chicken Soup for the Volunteer's Soul. Here is Elaine Hogg now to read her story. After this, I read the story, "Little Changes," accompanied to harp music.